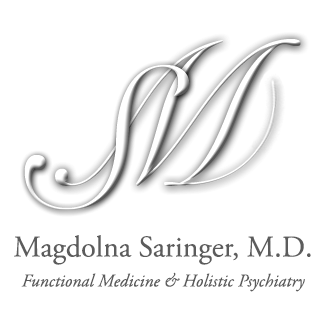 Psychiatric Services — Magdolna Saringer, M.D. In my private practice I treat children, adolescents, adults and families with chronic or acute illnesses. I believe in a holistic approach. It combines a thorough investigation to look for the root causes of cognitive, emotional and spiritual imbalances. My root cause analysis starts with a comprehensive online questionnaire you fill out prior to our first appointment. Through conventional and specialty laboratories I look into your genetics, epigenetics; the gut-immune-brain connection; the role of the exposome: the interplay between genes, environmental toxins, and mental health. I test your hormonal status including the proper function of the HPA axis, thyroid, and the rest of the hormones. I investigate your energy regulation and all the causative factors of the elevated inflammation markers. The treatment plan is personalized and includes recommended lifestyle modifications: proper nutrition, sleep, exercise, stress management and targeted supplements. I prescribe medications for acute crises. Get in touch to inquire about details.